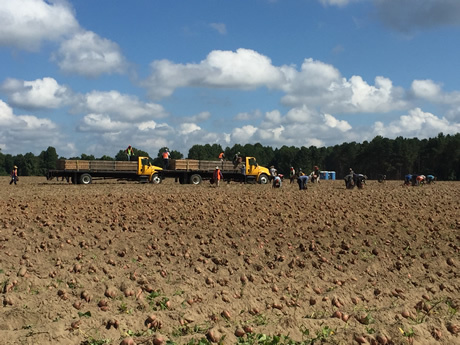 "Sweet potatoes are only becoming scarcer"
"The hurricane and constant rainfall have resulted in a significant loss of volume of sweet potatoes in North Carolina (US)", says Christiaan van der Goes of Dutch produce wholesaler, GreenGoose. "This is clear to see. Many suppliers cannot export any product because the volumes are simply not there. Or the product's shelf life is just not sufficient. Then there is also local demand." This means that, currently, sales prices are between the EUR1,20 and EUR1,40 per kg level. "This is serious money. It is quite a lot higher than the past two years. During this time, price forming was strikingly lower", says Christiaan. "It is also only going to become more difficult in the near future. This is because many sweet potato suppliers will fall by the wayside. They will not be able to guarantee their product's quality. The price will, therefore, only keep rising. This could mean that sweet potatoes will regain their exclusive status." According to Christiaan, the alternatives are also limited. "Almost all the European countries have begun cultivating sweet potatoes. This includes the Netherlands. This cultivation is developing. However, the European product does not have the quality or shelf life of the American product." "Honduras is on the market now but they are only sending product bit by bit. Spain's season is almost at an end. In the coming period, they will also be selling more local product", Christiaan expects.